If there weren’t certain copyright infringements to worry about, my argument against BASEketball would be to simply embed a video of the whole film right here and not say a thing. The connection between it and Dodgeball, besides the tenuous obscure ball-sport theme, is that they are both supposed to be comedies. And BASEketball suffers the minor setback of not being funny. At all. Similarly, to argue my case for Dodgeball, all I should write here are the rules of the game: the concept of the sport is hilarious enough just to read. Watching people get pummelled in the face by rubber balls is funnier than basketball, and it’s funnier than baseball. In fact it’s funnier than those two sports put together. It’s not just the concepts of the respective sports, it’s how they are presented. Outside America, nobody watches baseball or basketball, so we’ve already alienated most of the world’s audience. Even though we’re led to believe that Trey Parker and Matt Stone’s characters in BASEketball have created a new dumbed down version of the sports, it’s actually quite complicated, and the rushed few seconds they spend explaining/making up the rules leave the audience not fully understanding and therefore not caring about the film’s eponymous subject matter. Although the rules of dodgeball are much easier to grasp, the film’s director still takes the time to explain them fully, through Hank Azaria’s young Irish ace Patches O’Houlihan in one of those ancient PSA-style instructional videos. Now that we are up to speed we can get back to the sweet sound of hollow rubber on bone. Matt Stone and Bill Murray/Rik Mayall cross Trey Parker just can’t cut it as leads, their dialogue as embarrassingly unfunny as the film’s continuously shoddy slapstick. Throughout the film it is fun to catch strains of the various South Park characters (a much higher quality output) the pair voice, until even that is ruined by Parker’s shameless full-on Cartman rendition. And I’m sorry, but Jenny McCarthy’s fat head should never be allowed on screen. 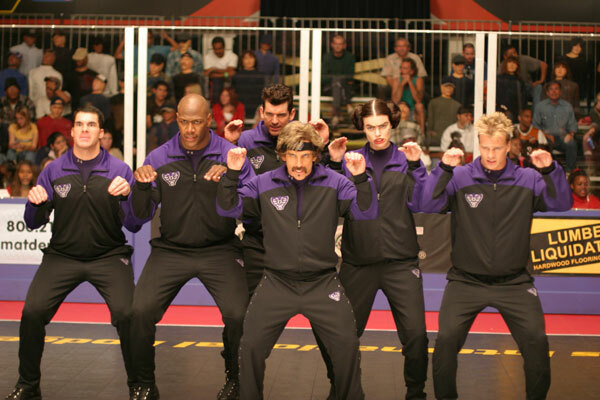 Even on the cameo front, Dodgeball is leagues ahead. Granted, BASEketball scores an awesome appearance from Robert Stack, complete with what is probably the greatest TV theme tune of all time: Unsolved Mysteries. But Dodgeball boasts a very rare, actually funny and not gratuitous cameo by a sports personality in the shape of Lance Armstrong. And can you name another film that has The Shats, The Hoff and Chuck Norris on its cast list? Its opponent simply cannot compete. Just like the capped BASE in its title, the ‘comedy’ is too obvious. A perfect example is when Stone visits that original gag of accidentally throwing a priceless piece of sporting memorabilia in a fire: just try and count the number of times the camera zooms in on the signature – Yeah, we get it, thanx. There are some technical points BASEketball can claim small victories on: for example, the psyche-out concept is something I would like to see explored further in professional sports. Plus Dodgeball does have a bit of a lame ‘I’m bisexual/We bet on ourselves’ ending (isn’t that illegal?). But overall, Dodgeball pwns BASEketball as sure as Joanie loves Chachi. It’s the bottom of the ninth. We are going into a tie break. There is one wicket left. We have gone to extra-time. The game has entered the fourth quarter. Whatever your preferred sporting cliché, whose team would you rather be on? The Average Joes of Dodgeball, led by the charisma-free zone that is Vince ‘Yes, I am playing myself in this movie. Again.’ Vaughn? Or the Milwaukee Beers of BASEketball, headed up by the twin titans of Trey Parker and Matt Stone, the men who gave the world the genius that is South Park? There really is no contest. Dodgeball: A True Underdog Story is a solid comedy with a generous smattering of laughs, but it can’t match the goofy charm of BASEketball, from which it pilfered several ideas. Dodgeball may have star power – Vaughn is joined by his regular sparring partner Ben Stiller as the deliciously ludicrous White Goodman – but BASEketball has something that cannot be bought: real heart. Puerile and stupid it may be, but when Joe ‘Coop’ Cooper (Parker) and Doug Remer (Stone) are going for glory in the Denslow Cup you can’t help but will them to victory. They are such dolts you take a shine to them, even when they fight over Yasmine Bleeth. Come on, what two guys haven’t fought over Yasmine Bleeth? Meanwhile, over on ESPN 8: ‘The Ocho’, you really couldn’t care less if Average Joes get wiped out by Goodman’s Purple Cobras, something highlighted by the movie’s admittedly rather good alternate ending. Dodgeball is a game where you throw a ball at someone – that’s pretty much it. The film relies too heavily on hitting Justin Long with various objects (funny the first but not the 52nd time) and unforgivably kills off its best character, Patches O’Houlihan. BASEketball, on the other hand, has many facets. There is the admirable laziness in combining basketball and baseball but leaving out the running (and boredom) that pervades those activities. Its trump card though is the psyche-out, allowing players to distract their opponents by any means necessary. Calling people fat, verbally abusing their mothers and pretending to cut off your finger isn’t clever, but it is funny. BASEketball has just too many winning plays up its sleeve. It features an excrutiatingly long lip-locking between its two male leads, a little boy with a liver problem downing tequilas and yes, lest we forget, the radiant Yasmine Bleeth. Dodgeball’s blatant theft of BASEketball’s ideas, from the slights on TV sports coverage right down to the scantily-clad dancers at courtside, further highlights its inferiority. There is no need for this battle to go into overtime. BASEketball is the clear winner. This entry was posted on February 20, 2009 at 1:59 am and is filed under BATTLES with tags BASEketball, Ben Stiller, Dodgeball, Matt Stone, Movies, Trey Parker, Yasmine Bleeth. You can follow any responses to this entry through the RSS 2.0 feed. You can leave a response, or trackback from your own site. Well McG’s BASEketball has eh..er..BASEketball (i must admit i have never watched the movie) but McD’s Dodgeball has a SPANNER IN THE GROIN, which he actually failed to mention in his write-up! Its only the best part of the movie McD!! Whatsa matta with you eh!!!? Your lucky you ‘cook’ a mean chinese! BASEketball has The Happy Dance. That’s enough for me. Sqeak slept with your sister mcd! Both terrible, but Baseketball is slightly less terrible. Enjoyed the battle, good work Ross v Dross.